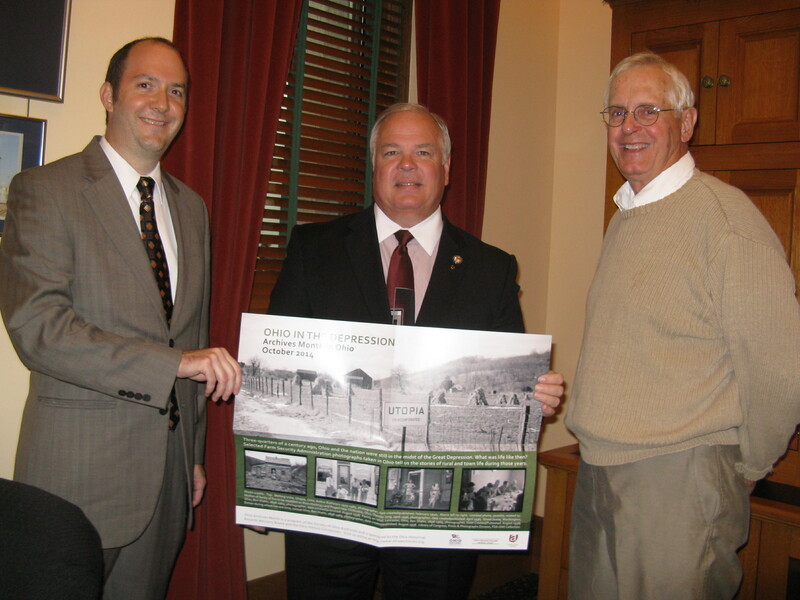 Ohio Senator Joe Eucker (center), who represents Clermont County (Utopia) in the state senate, receives a 2014 Archives Month poster from State Archivist Fred Previts (left) and SOA Archives Month Committee chair George Bain (right) in his Statehouse office in early October. 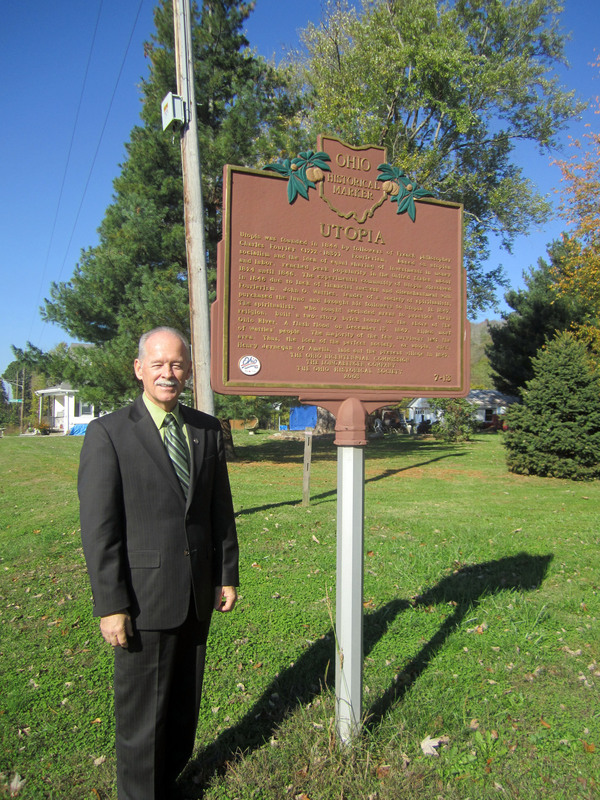 State Representative Doug Green, who represents Utopia, OH (Clermont County), poses by the historical marker that relates the community’s beginnings. 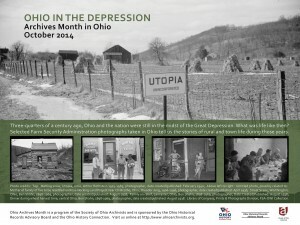 A photo of Utopia from 1940 is featured on the Society of Ohio Archivists’ Archives Month 2014 poster. Depression, arguably our worst economic downturn ever. It was a difficult time for many; it was also a time of profound changes the significance of which is still debated today. What was life like then? The number of Americans today who were alive during the 1930s–and the stories they have told or have yet to tell—grows smaller each year. The photographic documentation completed by the Farm Security Administration (FSA) captured the life of rural and town life across much of America. 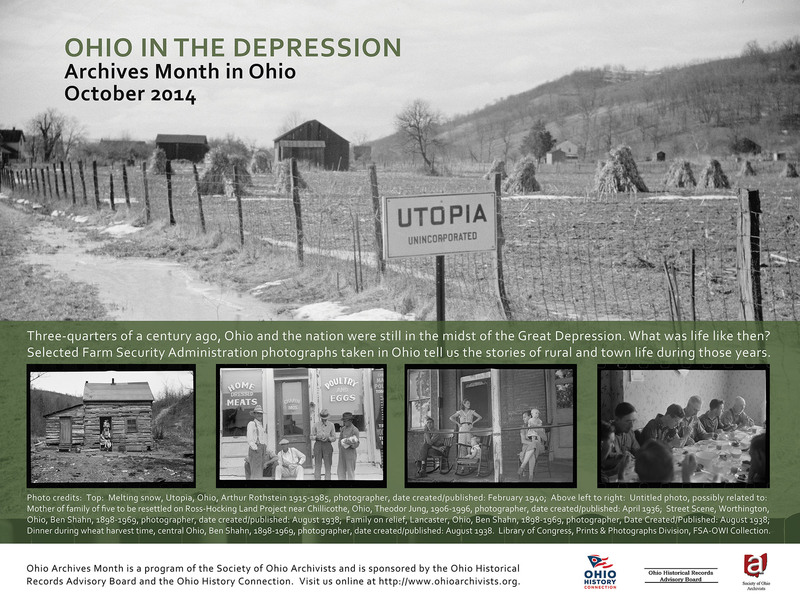 We archivists pay tribute to that project in our poster this year with a sampling of FSA photographs taken in Ohio. The SOA Archives Month Committee decided to feature Farm Security Administration photographs in the poster this year. The poster includes a primary photo supplemented by four smaller images. The smaller images photos were selected through a contest by SOA members utilizing a Survey Monkey instrument. See the gallery and the photographs selected for the 2014 Archives Month poster. Archives, museums, historical societies, libraries, and other organizations with archival and history collections are invited to participate in Archives Month this year by scheduling a special event or exhibit or lecture to highlight the collections in your institution. The Archives Month Poster should be available online by late summer, with our aim of mailing copies to members by early September. 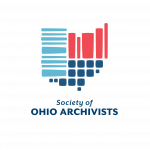 Also this year SOA is joining the Ohio History Connection to make the “I Found It in the Archives” contest a state-wide program. SOA and the Archives Month Committee hope archival centers will conduct a contest of their own—starting in the spring. Connect to the “I Found It in the Archives” page for more information. Hold a kick-off reception with a featured speaker on the importance of preserving archival records, e.g., an archivist or librarian, researcher, or local government official. Don’t forget to invite the press! Display the official Archives Month Poster in your offices. Develop a website consisting of your institution’s contributions, if any, to the Ohio Memory Project. Send press releases to local media, including a description of your archival materials, an article using research from the materials in your collection, or photographs of some of the most interesting materials in your collection. Contact your local government officials and organizations in your community to let them know about Archives Month. Offer to speak about your collection and what resources in your collection could be of use to them. Or (if possible) offer to be a repository for their historic materials or offer your expertise in helping them organize their archives. Create an exhibit of some of your materials in your institution. Have a program of readings that feature choice items from your collections and have members of your community do the reading! Better yet, get together with other repositories in your community or region for a joint program. Once you have decided on an event or program, please submit it to the calendar of events for Archives Month in Ohio.